Win a chance to “Meet ASIMO”. 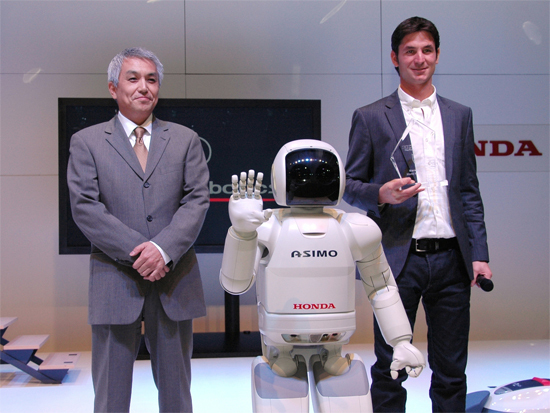 Yes it is possible now to meet ASIMO; Honda has recently announced a Social Media Contest. Honda took this step on the basis of increasing popularity of “ASIMO”. Now “ASMIO” online fans can prove their love and passion just by giving answers of simple questions. If you are interested to win this contest, you must justify your affection for ASIMO with solid reasons. ASIMO (Advanced Step in Innovation Mobility) was created to help people in effectively carrying out their routine work. It is also serving as a motivational and inspirational factor for people who have deep interest in science/Math. ASMIO was presented in various international events and inspired millions of people all over the world. ASMIO fans that missed the chance to see it live can see it online. You can visit “Facebook Page” of “Meet ASIMO” contest that will last from 11th Feb-7th March. Send 2 photos with “ASIMO” in printable form. Reply to 5 details about ASIMO. Finalists will be chosen on the basis of their level of creativity and height of love for “ASIMO”. You can also request your Facebook friends to vote for you. Winner will get a chance to stay 3 days with family of 4 members at Disneyland Resort. Additionally, you will be honored to meet ASMIO. What are you waiting for? Participate in “Meet ASIMO” contest and win this golden opportunity.